If you are planning a large event, you likely have started the search for an appropriate venue that can accommodate your needs. If you are looking for a large Tulsa venue for your event, there are many reasons why STOKELY is the perfect fit. Here are some of the ways that Stokely Event Center can help make your event a success! Depending on the size your event, you will need to ensure that the venue you choose has enough space. Not only does this ensure that your attendees are comfortable, it keeps you in accordance with fire codes that could otherwise get your event shut down. As a large Tulsa venue, Stokely Event Center spans over 35,000 feet to provide extensive usable space. It’s important to make sure that everyone at your event has a good time, requiring many different entertainment options. 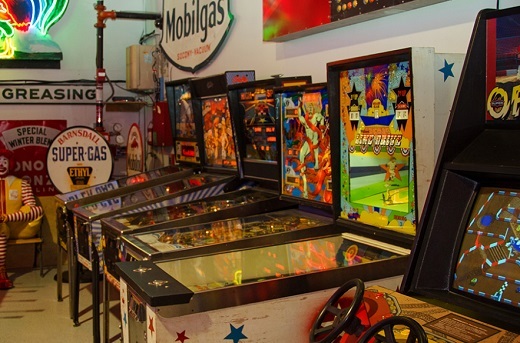 Stokely Event Center has classic arcade games set to free-play, a phenomenal plug and play sound system and dancefloor lighting to help set the mood. No matter what your guests choose to do for fun, we can likely accommodate! Nothing sets the mood for a party like a unique atmosphere that makes it easy to let loose and have a good time. As the most unique large Tulsa venue, our décor has been praised by our past guests. By utilizing an assortment of vintage and neon Route 66 signs from Tulsa’s past, we create a fun, nostalgic atmosphere that is sure to be loved by guests of all ages. If you are currently looking for a venue for your event, Stokely Event Center can make sure your special day is unforgettable. Guests to your birthday party will love the free-to-play games and a wide assortment of decorative signs. With the flexibility of catering in outside food and drinks, event menus can fit a variety of preferences. Our sound system, projector and screen are included for one great price to meet your audio/visual needs. If you are interested in reserving Stokely Event Center, please call us at 918-600-4448 or complete our online request form. We can’t wait to be part of your special day!